Without question the current Honda Pilot and CR-V when equipped with AWD can do some dirt time. Honda’s leading sellers can also trailer haul a toy or two. So, why is Honda marketing a reborn Honda Passport? Simply put, they can, and if priced right, 2019 Honda Passport will be successful. Passport comes to market built on Honda’s universal light truck platform, sharing most attributes, options, and chassis engineering with the longer Honda Pilot. That’s fine. Pilot’s a mechanically bulletproof, well priced contender in the midsize 3-row SUV segment, and continues to lead that class in annual sales. While Honda unibody primary front wheel drive technology when equipped with i-VTM4 (torque vectoring all-wheel-drive) works very well on all surfaces and weather conditions, insufficient ground clearance and relatively long front and rear body overhang is not cool when transitioning in or out of a steep inclines. 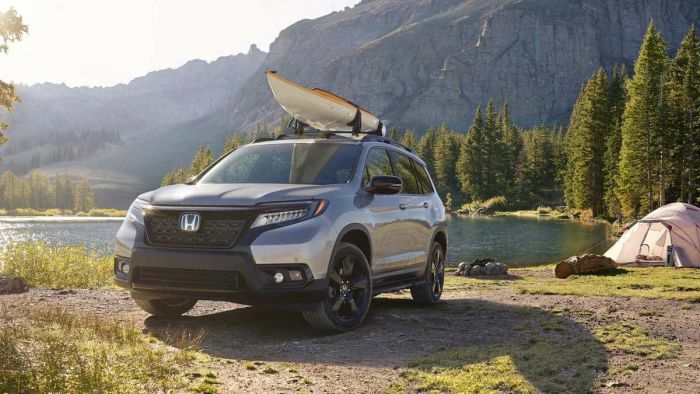 So, our engineering design friends at Honda R&D,Torrance,California and Raymond, Ohio, collaborated on launching a made in America Honda Passport with greater ground clearance, shorter body overhangs, nimble, power steering, and front and rear independent suspension. Passport will tow 5,000 lbs when properly equipped, and takes to the open and off road with the best in the segment. Buyers won't find a turbocharged engine option for 2019 Honda Pilot. Instead, America’s #5 car maker looks to the 3.5L 1-VTEC direct injected SOHC V6. Developing 280 H.P. @ 6,000 rpm and 262 ft-lb [email protected] rpm, we like this gasoline engine for Passport. When standard equipped with dual exhaust and shifted through Honda’s 9 speed automatic transmission, fun will be had by all on or off the road. Fuel economy, while yet to be stated, should approach 19 mpg city, and 24 mpg on the highway. We further anticipate a beginning FWD standard Passport package MSRP of $29,000 +, we’ll see. Black out grill, 20 inch wheels, and a sporting rugged theme, delivers a reborn made in America Honda Passport. I’ve driven thousands of miles on and off road in CR-V, Pilot and Ridgeline, all exceptional in their own right -- yet compromised just a tad when driven off the pavement. Honda presents a re-imagined Passport for consumers shopping for an affordable answer to civilized do-anything attainable truck-like SUV ownership. I believe Honda has a winner here, and look forward to presenting a comprehensive drive review in January. Intelligent Variable Torque Management™ (i-VM4™) with Intelligent Traction Management with Normal, Sand, Snow and Mud modes. Steering - Electric power-assisted (EPS) rack-and-pinion. 3,500 lbs (5,000 lbs) with tow package. They look cool. 3.5L with that much HP is awesome too for the trails and a 9 speed auto. 29K price tag supposedly? Not bad. Looks like it's almost perfect, and it's a Honda. The AWD with towing package is better than I foresee the Forester being equipped for quite some time. I would have bought a Forester this year, if only the engine wasn't so anemic. Even with the small HP bump this year, the Forester can't get out of its own way. The Forester would be perfect, if only they created a small displacement (3.0 or 3.2L) modern, fuel efficient, direct injection V6 to put in it.Since that is not an option, I am very much looking forward to buying a Passport when it comes out. Neither the Forester (nor Outback) will be the main Subaru competitor for the Passport -- it will be the Ascent (even though it has 3 rows). Similar price, dimensions and power with the same 5000# max tow rating as the Passport. We must have not driven the same Passport. I just drove the Honda Ridgeline, Passport and Pilot - all V-6 with 280 hp. The Ridgeline's and Passport's responsiveness off the dime and when you punch them up on the highway is terrible. However, the Pilot acquits itself quite well in that area even though it seems to be the largest and heaviest of the three. Hard to believe, especially if you consider the fact that beginning of the line Audi, Mercedes, or BMW 4-cylinder SUVs with about 200 horses accelerate much faster. If you're looking for a fun-to-drive SUV that won't break the bank, the Ford Escape and Kia Sportage may be your best bets.